As esports continues to distinguish itself among popular culture and become increasingly more prevalent, there’s a prosperous betting handle growing alongside it. That’s right - while the term esports has probably surfaced in one way or another, most individuals are unaware of this lucrative and exciting new venture of wagering on the games. While there are countless amounts of games to play, there’s only a handful of them being competed at the top level and an even smaller amount being offered by bookmakers to bet on. Most commonly, you’ll see esports such as CSGO, Dota 2 and League of Legends - these are considered somewhat of the 'big three' which, according to Betway, account for roughly 60% of the betting market. Less popular games like StarCraft, Hearthstone and NBA 2K as well as a scattering of other esports are also present, just on a less prevalent scale. It’s tough to pinpoint just how large esports betting is at the moment, although, a report by Business Insider in January evaluated it to be around $900m, and that number is poised to swell over time. There’s also a sizable unregulated skin gambling market - however, due to its unregulated nature, the statistics for online wagering in this form is a bit more ambiguous. In terms of the opportunities to bet on esports, there’s certainly no shortage of events and leagues throughout the year. The NBA 2K League, for example, has a season structured similarly to its predecessor with weekly games. If you fancy a more high-stakes event, you can look into Valve’s annual Dota tournament - The International - which this year featured a prize pool of $25.5 million. It’s not uncommon for those unfamiliar with the digital sport to pigeonhole esports as one thing - the reality though, couldn’t be further from the truth. Just as hockey and basketball are two completely different sports, the same applies to CSGO and Dota, which are different genres of esports with different communities and audiences. In some cases, esports can be the difference between a sci-fi military strategy game like StarCraft as compared to a realistic first-person shooter such as Counter-Strike - and the contrast between one and the other is much more comprehensive than at face value. A game like League of Legends can be daunting to new players given its complexity, whereas a point-and-click shooter like Counter-Strike is often considered far more accessible to the mainstream. Esports is an incredibly fast moving scene, so having the inside track when betting on a matchup becomes much more difficult if you’re trying to follow more than one game at a time. Our advice? Stick to an esport you enjoy watching or one you have experience playing if you plan on putting some money down. Likely the most important part of the esports betting equation are the odds (moneylines). Odds are by definition a numerical expression that signifies the likelihood of an outcome. For example, a team that is heavily favored to win a match will have low odds, meaning it is a likely outcome, while high odds (offering larger payouts) are far less likely to occur. There are three main variations of moneylines - fractional, decimal and American - each represent the same odds, just in a different format. The difference in presentation is simply preference. If you have found yourself accustomed to one or the other, it's typically not an issue, as betting platforms allow you to select which way you’d prefer to observe the spreads in. With the current data technology, there typically aren’t substantial differences in moneylines from (reputable) esportsbooks. However, you can find slight variations from site to site that can offer a few extra bucks. It’s pretty simple logic that a bettor would want to place a bet through an oddsmaker offering odds of 1.8 rather than 1.7. 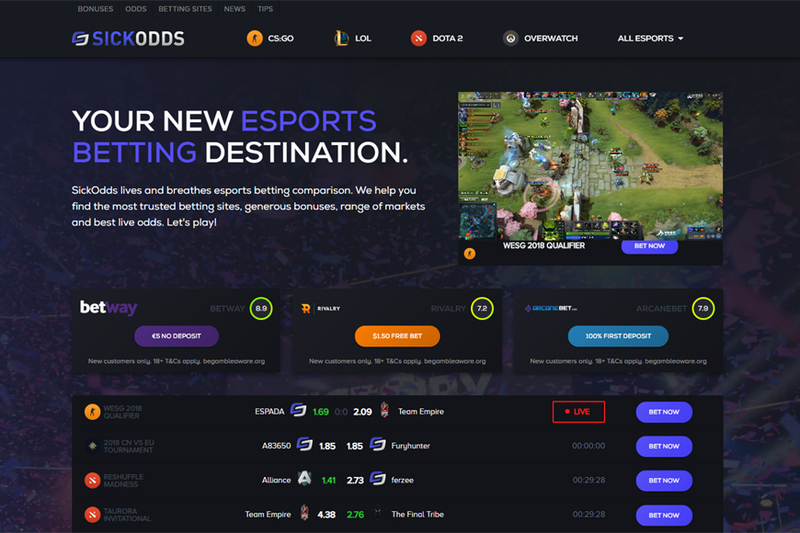 Rather than sifting through a number of different betting sites to find the best odds available, there are esports odds engines like sickodds.com which compile and showcase the best possible lines and markets from top sportsbooks. Odds tend to fluctuate on the fly in real-time though, therefore patience in placing a late bet can sometimes pay off big! Finding the right betting site for you can be tricky - a good place to start would suitably be finding a sportsbook that offers markets on the esports you’re most interested in. No two betting platforms are the same, especially in a comparably young esports market - some sites specialize in only a few games while others offer practically all of them. Next, you should do your due diligence in researching these betting sites; understanding that the appropriate regulation is critical and that venturing down the unsupervised route can often lead to some major headaches down the line. Not to mention, all this online esports wagering is only available in a select amount of countries, so finding a platform that is legal and accessible in your region is needless to say, important. Withdrawal and deposit options are also part of the conversation; some bookmakers may offer a wider list of alternatives for depositing than others - potentially from credit card and PayPal all the way through to Bitcoin and everything in between. Equally, if not more important, are your withdrawal options - you want to physically see all that money you won, right? Right. Depending on the site, you may be cut a check or have the funds deposited right into your bank account or ewallet. Whichever you fancy is likely the option you want to ensure is available on a site before risking your bankroll. Now, with that being said, there are occasionally limits to withdrawing funds, meaning you’ll need a minimum amount of funds available in order to transfer the money back to you - all things to keep an eye peeled for. It’s not uncommon to see bountiful numbers of bookmaker adverts offering very generous deposit bonuses and welcome packages upon registering on their site - however, more often than not, there’s a catch. If every sportsbook gave a no-strings-attached $500 welcome bonus (as we’ve seen before - seriously) they’d all be out of business. So, in order for sportsbooks to control this, there are often checks and balances in place hidden throughout terms and conditions. These catches may come in the form of requiring a bettor to wager on a heavy underdog (favoring the bookmaker) or needing to win a high multiple of your bonus funds to withdraw them. Not all bookmakers are out to get you though, in fact, there are some that offer free bets with little-to-no commitment on your part, so it’s important to read the fine print to find out which bonus best suits your needs. In the US, options for betting on esports are limited and basically entirely unregulated; if you’re in the States and decide to go ahead with these sportsbooks anyhow, you’ll likely be gouged by pitiful odds that’ll eat heavily into your potential winnings. We touched on this briefly already, but we can’t stress enough that you’ll want to do the extra research to stack up odds against one another and ensuring that your betting destination offers competitive odds. Betting profitably is all about getting the edge and there’s a few ways to give you that inside track when placing a wager. We just discussed bonuses pretty in-depth, but again, free bets are a great way to minimize your risk and potentially parlay that freebie into something more. Bankroll management is a good way to arm yourself against cold streaks by literally limiting how much you can stake at a time. Betting with poor financial management is a big no-no in general, therefore taking proper care of your funds is likely going to help you limit losses and maximize profits. Serious esports bettors will typically never wager more than one hundredth of their overall sportsbook bankroll on any single bet. This approach ensures that the effects of variance are minimised, rewarding good decisions (on average) better in the long run. Tipster services are another great way to give yourself a leg-up when betting on esports; although not quite bulletproof, you may be able to scout out some individuals with high strike-rates for additional insights on a matchup. There’s a handful of good sites that offer esports betting tips, and you may even come across some users on Twitter including the likes of @SickOdds and @BettingGods who leave valuable information on their feeds. Tournament previews are also worth a read when sizing up teams at an event; skilled analysts will take to written pieces to offer a nice snapshot of the event ahead that can provide some good intel. Now that we’ve given you the full rundown, it’s time to place your first bet! How should you get started? Assuming you’ve gone through the process of choosing your esport(s) and betting site, you can now go on and make a deposit. If you’ve done your research, you may notice that some betting sites embed the match streams alongside the odds. While this is a nifty feature, it’s not all that common amongst sportsbooks - however, if there’s a line being offered by a bookmaker, there’s typically always a way to watch the game. Twitch is by far the most popular streaming platform for esports and that’s not likely to change anytime soon - chances are the match you just bet on is being streamed there for free. There are other options to watch esports online, including YouTube, Facebook and mainstream TV channels such as ESPN, although these platforms are still relatively small. Thank you for sharing this quide, it seems very good for beginners.